Consuming Chocolate Proves Fatal For Many Dogs Because Of Which Compound? The White Elephant Gift Exchange Tradition Owes Its Name To? Many, if not most, of us have heard the caution against giving dogs chocolate and usually in the form of a very serious warning that even a small amount of chocolate could kill a dog. The warning isn’t a wive’s tale and chocolate is in fact very dangerous to dogs, but why? Among the many compounds contained in chocolate such as caffeine and flavanol antioxidants, you’ll find the alkaloid compound theobromine. Theobromine is, when consumed by humans, harmless in dietarily-provided quantities and actually has known health benefits. It’s a mild stimulant, vasodilator, and diuretic just like it’s alkaloid-family sibling caffeine and has been both historically and presently used to treat heart problems and asthma. When consumed in the quantities found in even very rich/dark chocolate (regular quantities), it is impossible for humans to reach any sort of toxicity level with the compound, known as theobromine poisoning (but poisoning is possible if chronic or acute consumption of large quantities occurs). The same cannot be said for dogs, however, as they metabolize theobromine at a much slower rate than humans. It takes as little as 1.8 ounces of milk chocolate to provide a fatal dose of theobromine to a small dog and 14 ounces can prove fatal to larger dogs. 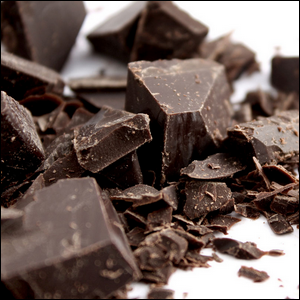 Dark chocolate contains up to 10 times more theobromine than milk chocolate and, thus, leads to acute toxicity in smaller doses. What’s interesting is that dogs are not the only mammals for which theobromine is metabolized slowly enough to be toxic in small doses. The common domestic cat is also just as much at risk for death via chocolate consumption as dogs are, but because most cats lack sweet taste receptors, they are very disinterested in eating chocolate (as they only taste the bitter alkaloids and not the sweetness like we and our dogs do).